At the turn of the year, and just over 2 months ahead of the Italian elections on March 4, we presented a stunning observation from Citi, one suggesting that even before any potential political risk emerges in March, private investors had long ago fallen out of love with Italian BTPs and had taken to the hills. As illustrated in the chart below, just about every other major investor type has become a net seller (to the ECB) or a non-buyer of BTPs over the last couple of years. Said differently, for well over a year, the only marginal buyer of Italian bonds has been the ECB (dark blue). Then, overnight, Jefferies was kind enough to collate the latest ECB sovereign debt flows data, and revealed another stunning finding: one of the biggest sellers to the ECB has been none other than Italian banks themselves! 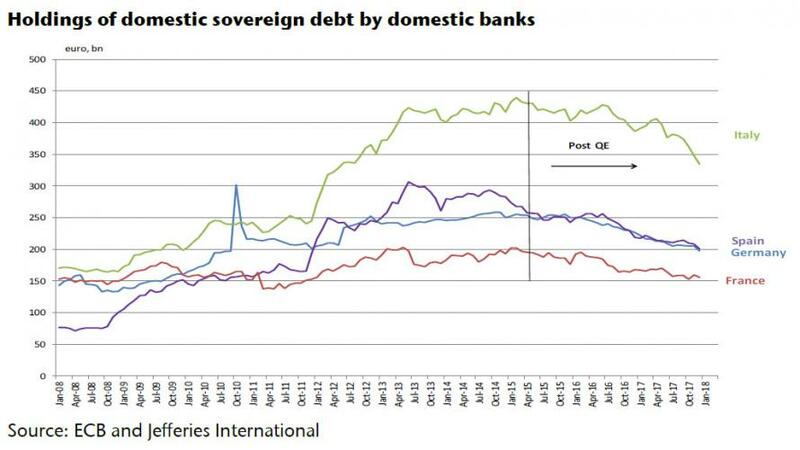 The breakdown below shows significant moves by the banks in all four largest euro area economies. However, the Italian banks are again in the spotlight; they reduced their domestic sovereign debt holdings by a hefty €12.6bn in December, and by €40bn (10.5% of outstanding stock) in Q4 as a whole. There is strong seasonality in the data, as banks book trading profits and dress-up their balance sheets for year-end; but even by previous standards, this move in recent months is unprecedented. 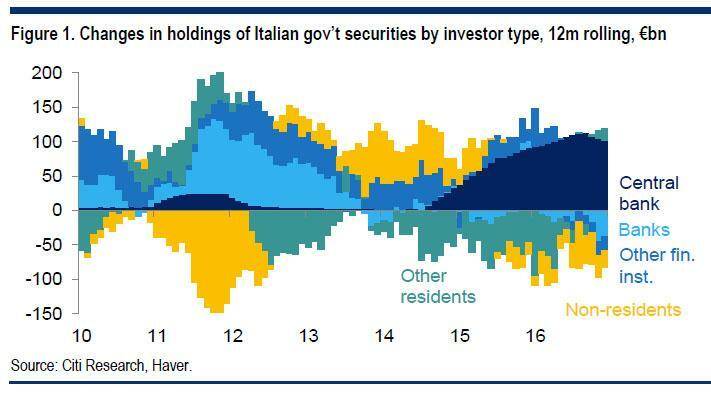 It is indeed, and as a side note, since the start of European QE, some €100 billion in Italian bonds have changed ownership: from Italian banks to the European Central Bank . On one hand, this is good news as it suggests that Europe's "doom loop" is finally breaking. Recall that the biggest risk facing Europe in the 2011-2013 period was the surging purchases of their own sovereign debt by local banks, which were too afraid to put money into other non-backstopped assets. And, according to some, the resultant record holdings is one of the reasons why the ECB launched QE: to send the prices of European sovereign bonds soaring, unblocking European bank balance sheets and allowing the traditional credit machinery to work again. The flip side is that while European banks have been selling sovereign bonds, they have been shifting the proceeds into other, far riskier assets, assets which will tumble the moment the market prices in the departure of the ECB as Europe's buyer of last resort. And while it is unclear how long until that moment of epiphany occurs, keep an eye on Italian banks and their BTP holdings: once the reduction reverses, and banks start bidding up, it's safe to assume that Draghi's next QE program can't be too far behind. As for the political risk, and potential fallout from the upcoming Italian elections, fear not: by now the ECB is surely one of the biggest owners of Italian bonds, and if something unexpected happens, well Draghi will always pull something out of his sleeve, "whatever it takes."